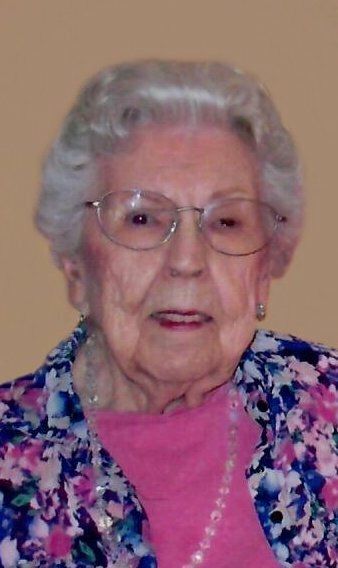 Obituary for Virginia Lewis | McCombs Funeral Home Inc.
Virginia G. Lewis, 99, of Cape Girardeau, passed away Monday, August 20, 2018. She was born June 9, 1919, in Sikeston, Missouri, to Robert P. and Helen R. Hollister Stubblefield. She and Earl G. Lewis, Sr., were married December 24, 1939, in Cape Girardeau. They had been married nearly 63 years when Earl passed away September 20, 2002. Two sons were born to their union. Virginia was a homemaker and briefly worked at the Cape Public Library and Kent Library. She was a longtime member of Abbey Road Christian Church in Cape Girardeau, and resided 14 years at Saxony Lutheran Village in Cape Girardeau. Virginia’s interests included painting, traveling, and photography. In recent years, she became an avid Cardinal baseball fan. Loving survivors include her sons, Earl (Marilyn) Lewis, Jr. of San Diego, California and Cary (Emma) Lewis of Cape Girardeau; seven grandchildren, Earl (Andrea) Lewis III, Keith Lewis, Mark Lewis, and Melissa (Greg) Tallman all of San Diego, Kendall (Melanie) King and Derek (Tracey) Lewis of Cape Girardeau, Deana (Nick) Butler of St. Charles; and nine great-grandchildren. Visitation is from 10 AM to service time, Friday, August 24, 2018, at McCombs Funeral Home in Cape Girardeau. The funeral is at 12:30 PM, Friday, August 24, 2018, at the funeral home, with the Rev. Doug Job officiating. Burial will follow at Fairmont Cemetery in Cape Girardeau. Memorials may take the form of contributions to Abbey Road Christian Church. To view Virginia's personal video, click below.